"The experience of a lifetime." a day before the LPGA's first Major begins. Wow. Other quotes include, "The highlight of my life," "How did I ever live without the Pro-Am," and "Oh my gosh, I just played golf with Lydia Ko and I can't breathe." The Pro-Am is a different kind of experience. One of those once-in-a-lifetime kind of experiences. It's an 18-hole event where the LPGA pros play alongside amateurs just like you. You'll get to play the Dinah Shore Tournament Course less than 24 hours before it hosts the year's first Major. It goes without saying, but the course is in pristine condition, and the pros are at the top of their game. It's an amateur-friendly "scramble," so even if you're not the best golfer, you can still enjoy the experience. To make matters even better, we've adopted a format called "9-and-9". You'll golf with one pro on the front nine holes, and a different pro on the back nine holes—because two is better than one! The Pro-Am happens on Wednesday, April 3rd, with tee times in the morning and afternoon. We also have a really cool Pairings Party on Tuesday night, where you find out which pros you'll be golfing alongside the next day. Last but not least, stick around after your Pro-Am round for the Awards Party, where you can enjoy a few drinks and reminisce with your playing partners about all of your favorite moments of the day. If the most incredible golf experience of your life isn't enough, your Pro-Am package includes a whole lot more. You get one serious shopping spree, where you can load up on the latest golf equipment, apparel, and accessories. Invitations for you and a guest to both the Pairings Party (Tuesday night) and the Awards Party (Wednesday night). We throw in four Weekly Grounds Credentials, so you and some friends can enjoy the tournament—while you brag that you played the course with the pros. You'll also get two weekly parking passes for the lot at Agua Caliente. We've got packages for golfers flying solo, or in a flock of four. If you’re interested to find out more about the pricing please fill out the form below! Seriously, this sounds amazing. Sign me up! Yes, it is amazing. And yes, we would love to help you sign up for the 2020 Pro-Am. If you’re interested, please fill out the form below. Dianne from our tournament staff will contact you after the 2019 event is complete. You're a tough sell. 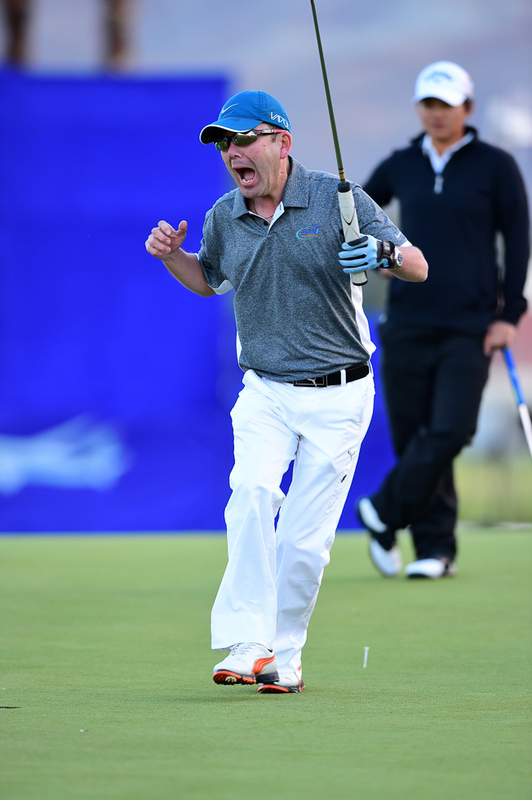 But don't take it from us: just look at these photos of people from last year's Pro-Am having the time of their life. "Reading a putt for Marina Alex and Caitlyn Jenner. It's cool. I'm cool..."
"Wha?! We just chipped in for eagle! Pretty please can I jump in the Pond?!" "Ok...I'm just going to come out and say it. I'm really nervous." Talks to self: "Why is this so difficult...? Just put the ball on the tee like you normally do." "Oh yeah. Crushed it. Thank you, adrenaline." "Karrie Webb has her hand on my shoulder...stay calm, breathe." "Whoa...how on earth...?! But she's like 18 years old!" "I was just saying to the guys, 'How on earth?!' Wow. Just, wow." "Did she just make that chip? She just made that chip! Woo! I didn't really want to take that shot anyway." "Uh, yeah, you're Lydia Ko. No need to tell me your name. I've heard about you. It's very nice to meet you." "Oh...now we're talking. This is cool. This is...really cool." "No Lexi, the pleasure is all mine. Now let's get out there and win this thing!" Hard not to smile when you take the walk over the Champions Bridge. Insert obligatory "Let's all wave like Dinah in front of the Dinah Shore statue!" photo here. 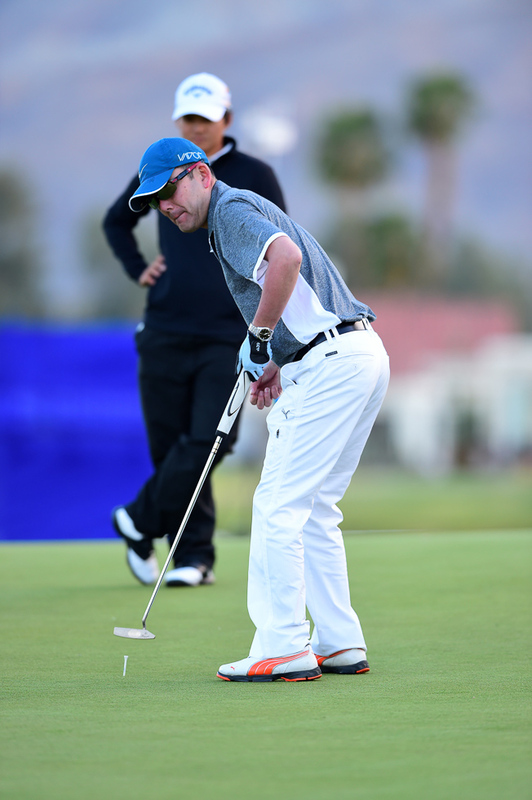 "There's no way I made that putt!" "Oh...this looks good...just play it cool if it drops..."
"Forget it! That was awesome, I'm the man!!" Maybe you just need to talk to someone? Dianne from our tournament staff would be happy to chat with you about the Pro-Am experience. Feel free to call her at (760) 834-8872 or reach her by email at dianne.mcpherson@img.com.